Download the new E46Fanatics app now! I'm pleased to announce that E46Fanatics now has a dedicated phone app! You can get our new free app from the Apple App store or Google Play store today. If you've been using Bimmer App, our previously supported app, that will be transitioned to support Bimmerfest.com moving forward. To continue accessing E46Fanatics you will need to install the new app, Bimmer App will be discontinued next week so get the new app now. Last edited by tim330i; 12-01-2016 at 07:20 PM. he's just the resident off-topic ball breaker. Dont take it personally. Loving the new APP! Thanks! First Bimmer..."Miss December"...2000 323i, purchased Dec. 2013 w/82K on the clock. PM thus far...pads/rotors, belts/pulleys, complete CS overhaul, FCABs, plugs, autotranny/differential service, fuel pump, filter, and relay. Full front end refresh with LCAs and bushings, struts and mounts, inner/outer tie rods, sway bar endlinks and bushings. How the hell do i access pms on the new app?! It is a bug, we're working on fixing it. My icon shows that I have "1" message/notification. Not sure what it could be.... all my PM's are read. Any thoughts? See attached...this is what I'm getting at random times. I've deleted and re-downloaded the app with the same results. Can't find a rhyme or reason as to it. iPhone 7 with latest iOS update. Does it happen with every thread or only specific threads? I'm on my iPhone 7 plus using the app now without issue. My problem is with all threads. 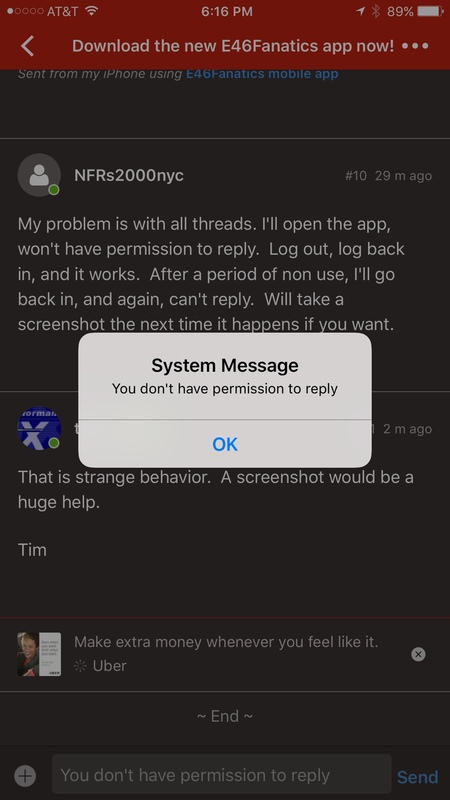 I'll open the app, won't have permission to reply. Log out, log back in, and it works. After a period of non use, I'll go back in, and again, can't reply. Will take a screenshot the next time it happens if you want. That is strange behavior. 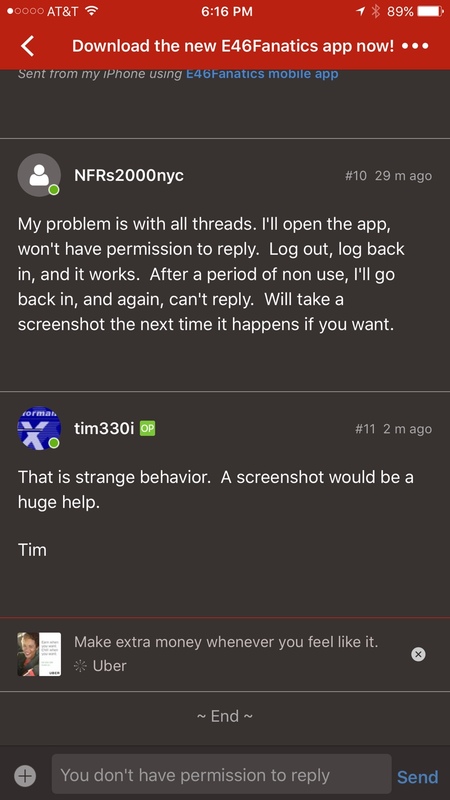 A screenshot would be a huge help. Hmmm...that's interesting. Different issue than what I'm experiencing. Mine is more random in nature...doesn't really matter which thread/subforum or whether I'm on wifi or LTE. Sometimes pages load sometimes they don't. Quitting and restarting doesn't seem to help. I can switch over and browse with tapatalk and everything loads fine. Weird! We updated the forum side plugin this morning. I'm hoping this resolves some if not most of the issues. Ok, everything seems to be working well now. 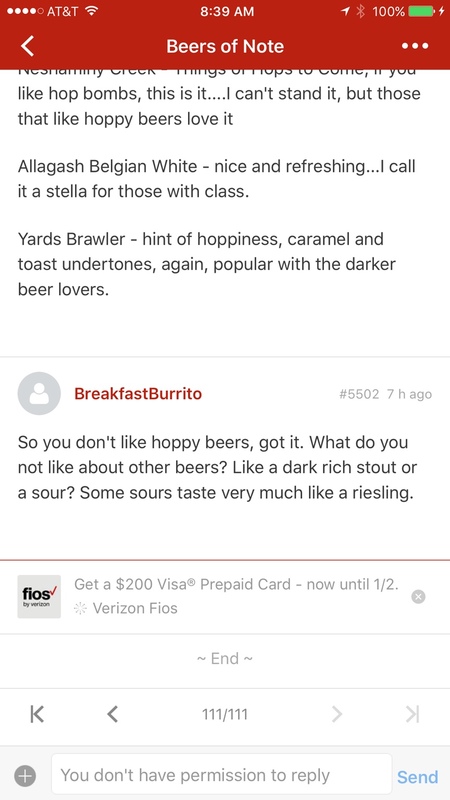 After your post, I deleted the app, reinstalled it, and deleted bimmerpost just to be sure there are no conflicts. That's good. Hopefully that is the last of the issues. Yes...same here...has been working smoothly all day! 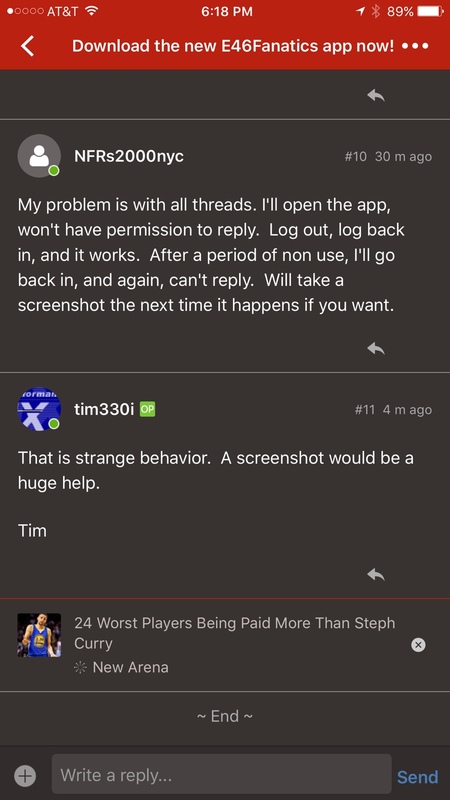 I didn't have to log out or anything....thanks Tim! Reinstalled, messages are available so thats good. For some reason my icon still shows I have "1" notification. Kind of annoying considering i never leave any message/email/update unread. Anyways, anyone else running into this issue? Problem is back. Can't reply unless I log in and out. Honestly I had this problem with the old app. On/off the entire time I used it.